Last night, in the Parade of Champions, 2015’s top Special Samba Schools strutted their stuff in triumph at Rio’s iconic Sambadromo. The Champions parade is a celebration. The competition is over and everyone, teams, spectators and officials, is in party mode. 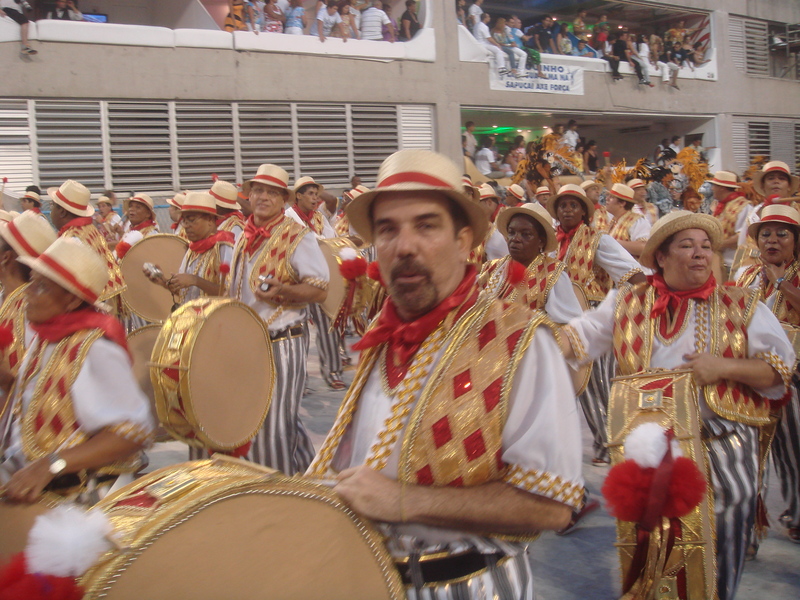 On that Saturday night in 2009, I was there, in frisor 12 of setor 9, the tourist section of the Sambadromo, where just five days before I had been for Segundo, the second night of the Special Samba Schools parade. Seats are cheaper at the Champions’ Parade and the crowd is different. These are the faithful, the die-hard devotees celebrating their school’s victory or their secure place among the top 12 in next year’s competition. Everybody knows the samba enreda by now. Everybody, even the tourists, can samba in some fashion or another. With the competition over, the parade is different too. The harmonia still have to keep everyone moving on time but they’re doing it with humour. The baianas are whirling but in more cavalier circles. The forca still have to push the floats but they laugh and joke as they do. The foot soldiers in the ala have broken their lines. They toss their heavy costumes into the crowd as they go. A head-dress lands nearby and a crowd of Japanese ladies fights for it, like a bride’s bouquet. The victor poses in it, her shoulders slumped beneath its weight. The others queue for their turn. The night is long but it passes quickly. It’s Sunday morning, just after five. The final dazzling float has just passed, trailing a triumphant posse of officials. Behind them come the orange-clad cleaners of the Prefeitura or City Council, with their bins and brooms. Still the sound of five hundred drums shakes the stands and strains of the last samba song echo up and down the avenue. Around us the stalls are emptying fast and only true stoics dance on. That feathered headdress now lies trampled among the litter of discarded programmes, cans and plastic cups. My hips are jelly and my feet lumps of smouldering sponge. I’ve lost my voice. My eyes are smarting, my ears are ringing and my brain is a race track where lines of random samba songs do endless laps. Carnaval is over.